General Hospital (GH) spoilers for Wednesday, July 19th promise viewers a day of unanswered questions, interrogations, shocking business propositions and special pleas. After Spencer Cassadine (Nicholas Bechtel) mysteriously turned up missing, it seems Laura (Genie Francis) will panic and immediately jump to the conclusion that Valentin (James Patrick Stuart) had some hand in her grandson’s kidnapping. General Hospital spoilers tease that Laura will reach out to Dante (Dominic Zamprogna) who will go into his cop mode and then goes to confront Valentin as he is exiting the Metro Court with his daughter, Charlotte (Scarlett Fernandez). 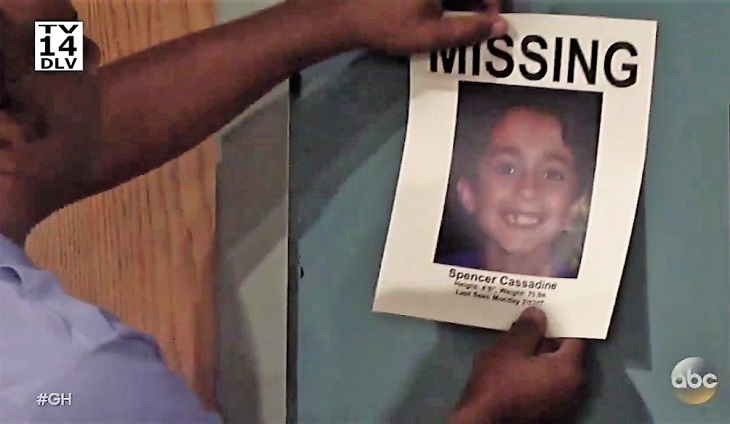 Spencer Abducted, But By Who? Jaw-Dropping Twist! Valentin did make a promise to his daughter that Spencer will not be a problem any longer- but exactly how far did he actually go? That is exactly what Dante will want to know since he will be investigating Spencer’s disappearance. GH spoilers indicate that Nathan (Ryan Paevey) will also be searching for answers in regards to Spencer’s disappearance. Nathan will make a call to someone in hopes that they might have answers that can help them know where to look for Spencer. Over at Crimson, Dr Obrecht (Kathleen Gati) shows up with a business proposition for Nina but what type of offer will the scheming doctor make? Chances are it will have something to do with her current predicament over at General Hospital now that she has been caught and fired. Spoilers indicate that on Wednesday’s episode of General Hospital, Finn (Michael Easton) will take yet another shock when Monica (Leslie Charleson) delivers news to Finn that will not bode well with him- did Finn fail yet another drug test? This is certainly going to raise more questions in regards to his drug use especially since Dr Obrecht is no longer working at GH so she can no longer be used as his scape goat. How will Finn explain his way out of this one? Also on Wednesday July 19, GH spoilers indicate that Julian (William DeVry) will make an emotional plea to Alexis (Nancy Lee Grahn) and will ask her for a favor on whether she will be a witness for him for the defense. Will Alexis agree to help Julian? All this and more in tomorrow’s episode of General Hospital. Stay tuned! Check back with Soap Opera Spy for more GH spoilers and news right here. Angela is a Full-Time College student studying Nursing. She LOVES to watch soaps during the week. She is addicted to General Hospital mostly but occasionally finds herself drawn into Young and Restless as well as Bold and the Beautiful. When she is not watching soaps, Angela enjoys going to the Cinema or Shopping at the mall. Angela is an admin for 3 GH groups on Facebook which keeps her very busy. Needless to say, she LOVES soap operas and is passionate about all the storylines and loves Lifetime movies!